4x MATRIKX® Pb1® only 59,00€! With this special offer, you get four (4) replacement filter cartridges MATRIKX® Pb1® for ONLY 59,00€! 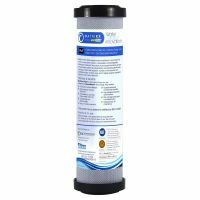 MATRIKX® Pb1® is a powerful, multifunctional filter cartridge for residential and commercial water treatment systems. er high levels of chemical reduction in potable drinking water, including chlorine, taste and odor. 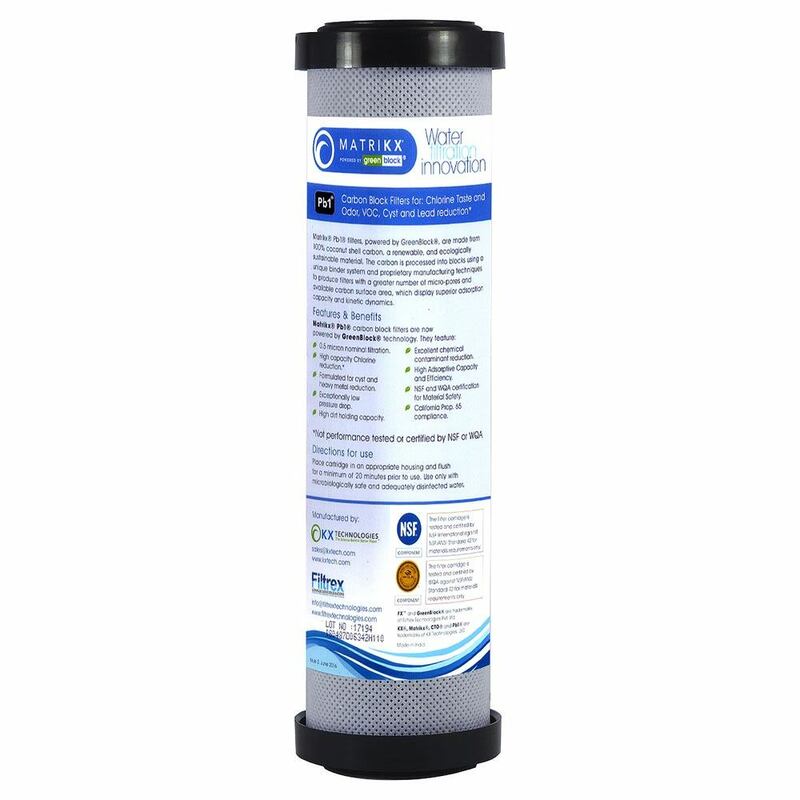 MATRIKX® Pb1® filters meet NSF/ANSI Standard 53, Turbidity and Cyst Reduction, including Cryptosporidium, Giardia, Entamoeba and Toxoplasma. ficiency. MATRIKX® Pb1® filters flow in a radial (outside-to-inside) direction, providing increased dirt-holding capacity and low pressure drop. Unlike granular activated carbon (GAC) filters, MATRIKX® Pb1® cartridges will not channel or bypass due to the extreme uniformity of their extruded activated carbon core. Service life of the MATRIKX® Pb1® filter is greatly extended by a prefiltration medium. IMPORTANT NOTICE: Performance claims are based on a complete system, including a filter, housing, and connection to a pressurized water source. This filter must be placed in an appropriate system, and operated according to the system's specifications in order to deliver the claimed performance. It is essential to follow operational, maintenance, and filter replacement requirements, as directed for each application, for this filter and system to perform correctly. Read the Manufacturer's Performance Data Sheet accompanying the system and change the filter as suggested. 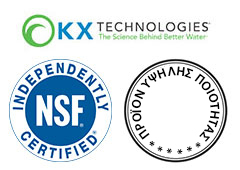 The contaminants or other substances removed or reduced by this water filter are not necessarily in all users' water. 1. Projected chlorine taste and odor reduction capacity when tested in accordance with NSF/ANSI Standard 42 protocol. * Nominal Filter Rating: Filter rating indicating the approximate size particle, the majority of which will not pass through the filter. It is generally interpreted as meaning that 85% of the particles of the size equal to the nominal micron rating will be retained by the filter. (WQA Glossary of Terms, Third Edition, 3-97). ** Absolute Filter Rating: Filter rating meaning that 99.9% (or essentially all) of the particles larger than a specific micron rating will be trapped on or within the filter. (WQA Glossary of Terms, Third Edition, 3-97). MATRIKX® filters are not to be autoclaved or steam-sterilized. Use this MATRIKX® Pb1® carbon filter only with microbiologically safe and adequately disinfected water, as it is not designed to kill or remove bacteria or viruses. Actual results obtained will vary with various combinations of organic contaminants, changes in pH or other conditions encountered in actual use. All information presented here is based on data believed to be reliable. It is offered for evaluation and verification, but is not to be considered a warranty of any kind. ushed for a minimum of 5 minutes prior to use. Το φίλτρο είναι πολύ καλό αλλά η τιμή του ακόμη καλύτερη! Με την προσφορά των τεσσάρων που πήρα, θα έχω να αλλάζω φίλτρα για τέσσερα χρόνια! 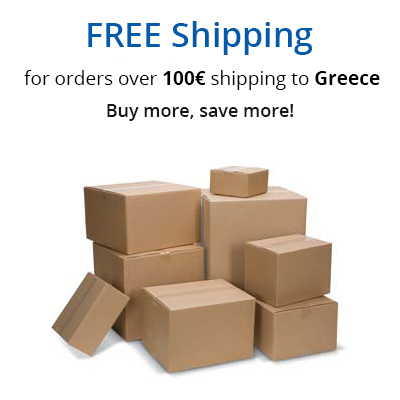 Ευτυχώς που δεν έχουν ημερομηνία λήξης.